I have been working every Sunday since September, with a group of teen acting students, on a play close to my heart: Thornton Wilder’s Our Town. The play is one of the most oft-produced in North American Theatre, and features some pretty big themes: Life, Love and Death. Not exactly a light-hearted farcical romp, this quietly moving play has demanded a great deal of commitment and maturity from our students – and I am proud to say – they have risen to the challenge. They “gave the show” to their audience, for the first time this past Thursday, and I want to do something special for their performance tonight, now that first night jitters are out of the way. Unfortunately, chocolate is one of the very worst things for an actor’s voice. I remember, as a young actor, giving a small box of chocolates to a lovely veteran actress for an opening night gift, and her thanking me for the sweet thought, but she informed me that she would hold off until after the show as, “they cause phlegm on the throat, dear – just so you know”. Although, I must confess to scarfing a few choccies down before the odd performance myself, we are trying to teach our students “best practices”, so I held off on giving them anything that would impede their diction and clarity before their first night. But I just can’t resist, now that we are open. There is a famous scene, in the middle of the play, involving two young characters, making a major life decision over a couple of strawberry ice cream sodas. Although everything is done in mime in Our Town, I still find myself craving one of these old fashioned soda fountain treats, every time they do the scene – a testament to their acting. And now that it actually smells like spring outside (for me, that means the season really has arrived), I long for fresh strawberries and ice cream. Realistically, those are quite a few months off, so instead, I go to my big freezer, and pull out a bag of the red beauties, frozen-at-their-peak last year, dust off my trusty table-top ice-cream maker, and pull down my well-thumbed copy of David Lebovitz’ The Perfect Scoop. Although I am looking for ice cream, he has a lovely recipe for strawberry frozen yogurt, which is perfect, and he has kindly repeated here. It churns up gorgeous, bright pink and smells heavenly. This will not do though, on its own for my actors, as they have to run around after the show, putting away costumes, striking the set and setting up for the show which alternates with us. It is not the glamorous business people think it is – there is a lot of heavy lifting – and they are really good sports! So. I need to make this treat portable, rather than the soda glass form. Ice cream sandwiches prove to be the solution. 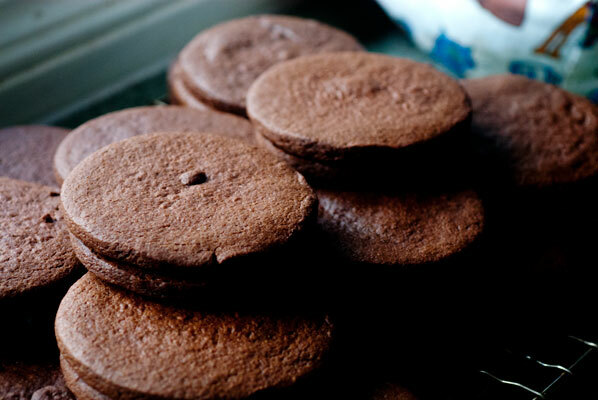 I bake up a batch of some of my favorite chocolate butter cookies. Rolled quite thin into 3 inch rounds, they prove to be a great carrier for the frozen yogurt, and I sandwich them, and wrap them in waxed paper for an old-fashioned look. Hmm. The ice-cream sandwiches are sitting in the freezer, firming up. I know the actors will appreciate these, but to my mind, I am still not satisfied, as I think about the themes of the play. I need to cap these off, or “put the button on the scene”, with something else. I pull out my favorite poly-carbonate mold and stare at it. Strawberry hearts. Absolutely right. And now I am humming. I dash about the kitchen chopping up white chocolate, and pounding freeze dried organic strawberries, which I have picked out of a box of granola. It crosses my mind that I should really find a good source of freeze-dried strawberries, so I don’t have to cannibalize my favorite breakfast cereal, but that is for another day. Once I have the chocolate’s temperature raised to 45 degrees Celcius, and have added in my seed chocolate, I sprinkle in the powdered berries, as I stir to bring the chocolate into temper. I try very hard not to get any excess air bubbles into the mixture, after my molding mishaps of last week, and soon the cooling chocolate turns a rosy hue. It is beautiful. But it is taking a very long time to cool! My partner comes in to tell me the barbecued chicken will be ready in five minutes, and I dash around, setting the table, between stirs. The chocolate still needs to cool about nine degrees, according to my super accurate thermometer, and we laughingly decide to proceed with dinner, the cooling chocolate at my side. 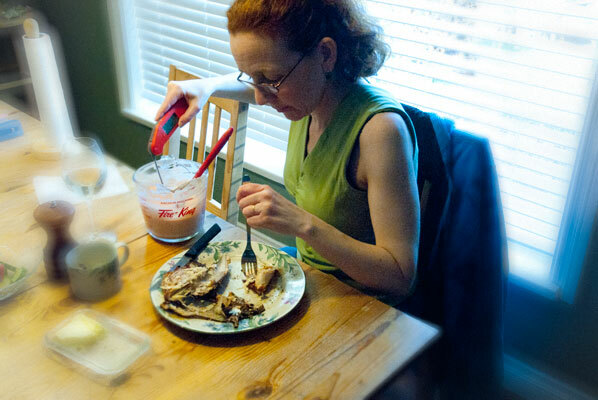 As dinner is usually a pretty talkative affair at our house, and I tend to get caught up in voicing my opinion about the subject under review, when our son comes in to join us, I tell him I am multi-tasking, and both of he and my partner take it on to prompt me gently throughout dinner to give the chocolate a stir and take its temperature. I am able to have a nice dinner, intelligent conversation with my family, a smart glass of wine, and temper chocolate all at the same time. My goodness, I must be more relaxed than when I started! 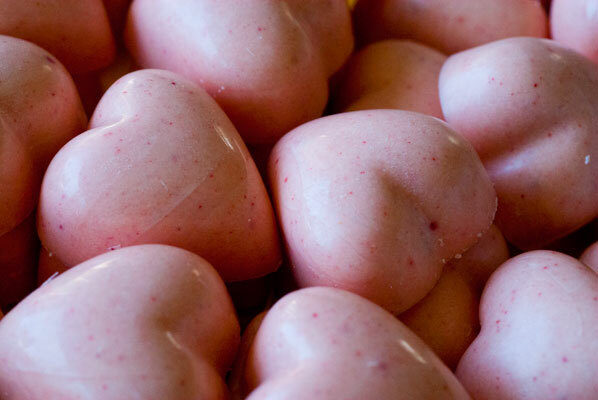 When the chocolate hits its cooling mark, I give it a gentle shot in the microwave oven, to raise the temperature back up to 31 degrees Celcius, then pour the pink-hued, strawberry scented and flavoured white chocolate into the mold. The evenings are still cool, and I can hear the chocolate mold cracking slightly, as I head off to bed. The next morning, I flip them over, give them a hearty bang, and out pop 24 beautiful hearts, plus extra “strawberry boats”. And I have to say – they taste just like old fashioned strawberry ice cream. 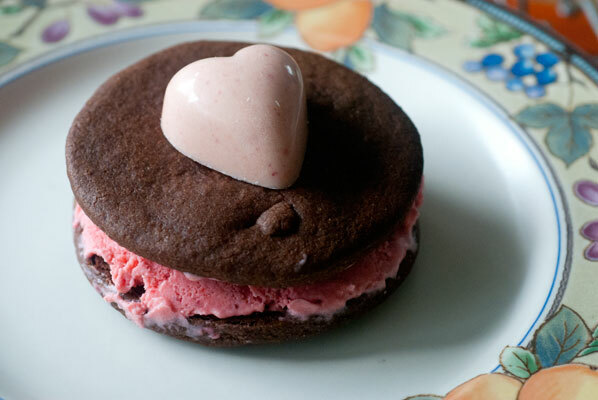 Here is a picture of one, adorning the top of an ice cream sandwich. And I guess that about sums it all up: the love in our hearts and to take the time to slow down, look around and experience the sweetness of the small things in life.